The reason we chose to be a fee-only investment advisory firm is pretty simple. We want to offer the best solutions to our clients without them having to wonder if this is the best thing for them or the best thing for their financial advisor. We always act as your fiduciary partner. Because we accept no commissions from any source you know that when we make a recommendation it is because we truly believe it will help you reach your goals. Our fee-only financial planners and wealth advisors are paid only for the services we provide for you—we accept no commissions. 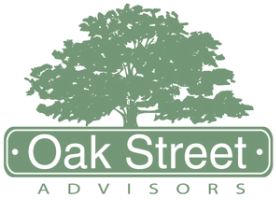 The foundation for client relationships at Oak Street Advisors is a personalized financial plan. ​Our experienced fiduciary financial planners and wealth advisors offer smart strategies—not sales pitches. Our personalized, professional financial advice will help you pay off debt, minimize your tax liability, start or sell a business, fund college educations for your children, retire when and how you want, and provide for the next generation. ​We designed the Fiscal Checkup to put your mind at ease. To put you on the right track for financial freedom. And to show you what a difference it makes to work with an experienced, independent, Fee-Only advisor who is paid for advise and not for selling you the financial product of the month or the stock of the week and always acts as a fiduciary. Not sure you need personal financial planning? Our Fiscal Checkup lets you experience first-class financial planning without making a long-term commitment. This is one click that can change your life.